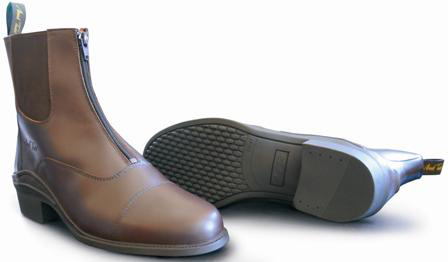 A front zipped paddock boot with mirage leather upper and aniline pig skin lining. Removable insole covered with forma and special “Dermo Dry” lining, and featuring a contoured sole for support and comfort. The boot also has a spur rest and a pull tag to help slide the foot in. Please scroll down for size guides. There are currently no questions for Mark Todd Chetwode Boot - be the first to ask one!